This video gives insight into the history and beauty of the Japanese stringed instrument, the koto, through interviews and performances by the highly respected Hideaki Kuribayashi. Hideaki Kuribayashi, a modern virtuoso of the koto, is the subject of this documentary. Through observing interviews and performances from Kuribayashi, viewers learn of the storied history of the koto, a 13 or 17-stringed instrument first introduced in Japan in the 7th century, imported from China. The Japanese made the instrument their own, increasing the number of strings from seven to thirteen and developing their own style of music and playing exclusively for Japanese royalty. 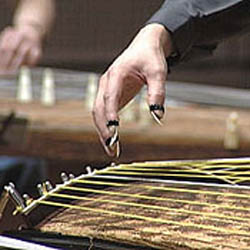 Modern koto musicians like Kuribayashi have incorporated modern Western music into classical koto compositions. Kuribayashi’s mentor Tadao Sawai was a leader in the movement to bring Western styles to the koto, and Kuribayashi continues the tradition today. In addition to performances from Kuribayashi like his composition “Aoku (Deep Blue),” he shows how he composes music for the koto by using other instruments and comments on his own creative process.